What an adorably small group for Toddler Time today. It was fun to see the three Toddlers we had at toddler time really show off their personalities today. For singing, there were lots of shouts of joy and peals of giggles as all their favorite songs were requested and immediately sang. When it was time to sing about dear Old MacDonald, he had a kitty, a horse and an alpaca on his farm. We learned the sound that an alpaca makes thanks to the little girl who requested an Alpaca and added it to our song. You can learn something new every day! And while the weather is a balmy 50 degrees with a little rain this morning and sunshine now so it feels all springy out, we had a snowman story and craft. Our story was All You Need for a Snowman. And when the story was done, we had all we needed for a snowman face at our tables! We didn’t actually use the glue sticks. Miss Denise was sure they must be needed because we need glue every Toddler Time but Miss Alicia had not set them out and Miss Alicia knew we did not need them. That glue all over the paper plate pretty much takes care of the need for a glue stick. After painting a special glue all over the paper plate, the snowman face parts were pressed on and then it was covered in glitter. Easy and sparkly! We attempted many photos of the group but Miss Denise couldn’t get the camera to take them fast enough to get the awesome shots we knew we could have had. Join us next week for a another snowman craft. It will be cold next week – different people have very different feelings about hearing that news – but snow man day next Tuesday as well! 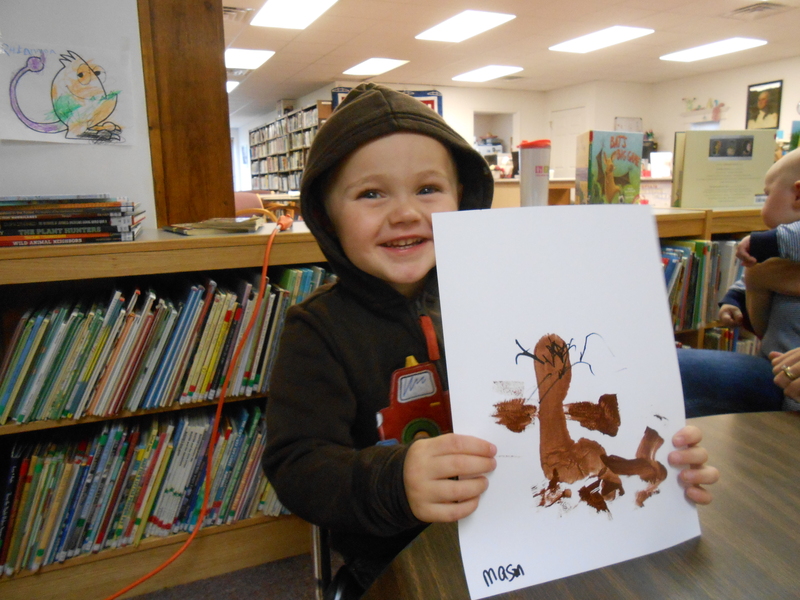 Join us on Tuesdays at 10:30 am for Toddler Time at the library. We have coloring pages set out until 10:45 and then it is singing, reading a story, craft time, a quick snack of some kind of crackers usually and then time to play with toys while parents chat. Come on out to the library and join us! Well, we don’t actually need the oatmeal. We need the Oatmeal containers. We are looking at making a fun basketball game with the kids on our Spring Break Fun Day April 2nd. We need these wide mouthed type containers and if you could donate them to us we would surely appreciate it. They don’t have to be Quaker Oatmeal, they just need to be about that size and CARDBOARD. That they are cardboard is key. Alicia mentioned that she thinks fancy ice cream also comes in about that size container and Denise was momentarily sad she hadn’t thought of that first but still, ICE CREAM so that should be making it on everyone’s grocery list this week. Seriously. If you are eating that much oatmeal, ice cream is fully allowed. If you could bring in your CLEAN containers to the library we we would so super appreciate it. Thanks for helping make Spring Break Fun Day a success! Toddler Time today was a fun book book Suzanne Bloom called Fox Forgets. Our toddler times start out with some coloring pages and then all the kids and parents come sit on the open carpet spot to sing some songs. Head and shoulders, knees and toes is a favorite right now (how fast can we go?) and we learned a new song about baby ducks from Victoria. But the favorite song of the day was Jingle Bells. After singing, the kids settle in to hear Miss Alicia read them a story. Today was Fox Forgets by Suzanne Bloom. After reading the story, the toddlers and moms/grandmas head over to the table to make a craft. We keep all the small parts of the crafts in envelopes. It makes passing out the cut out parts of the craft so much easier! When the kids are done with craft making, we have snack! Because after all the coloring, singing, reading, and crafting, kids are starving! We try to get pictures with finished crafts. Sometimes those photos turn out, sometimes they don’t. And sometimes we get so busy that we don’t catch everyone! When snack seems to be wrapping up, we pull out the toys. The train track is always a huge hit! While the kids play, the parents or care givers chat and look for books to check out. We start Toddler Time at 10:30 am on Tuesdays. When we say we start at 10:30, we mean the coloring pages will be out at 10:30. Getting toddlers and babies to Toddler Time is HARD WORK and we totally understand because we are moms and we remember well those days. We usually gather on the carpet at 10:45. Tuesdays are Miss Alicia’s favorite day, she loves to have all the toddlers come in and sing and sit with her while she reads a story! Miss Denise, who is completely uncrafty, sets out the crafts and runs the front desk during our toddler times. Toddler time seems to wrap up around noon when it’s time for lunch and naps. Come out and see us on Tuesdays! We kicked off Toddler Time 2015 on Tuesday, October 6th with this fun book by Laurie Keller. After reading it through once, we could see that we may have a slight problem saying a few of the foreign words. There was one in particular that we were pretty sure that if said incorrectly it would sound like we had taught our toddlers to swear. That would be kind of a bad way to begin our Toddler Time season. So we were THRILLED when we found the book is on VIDEO! Learning words foreign to us instantly got a lot easier. 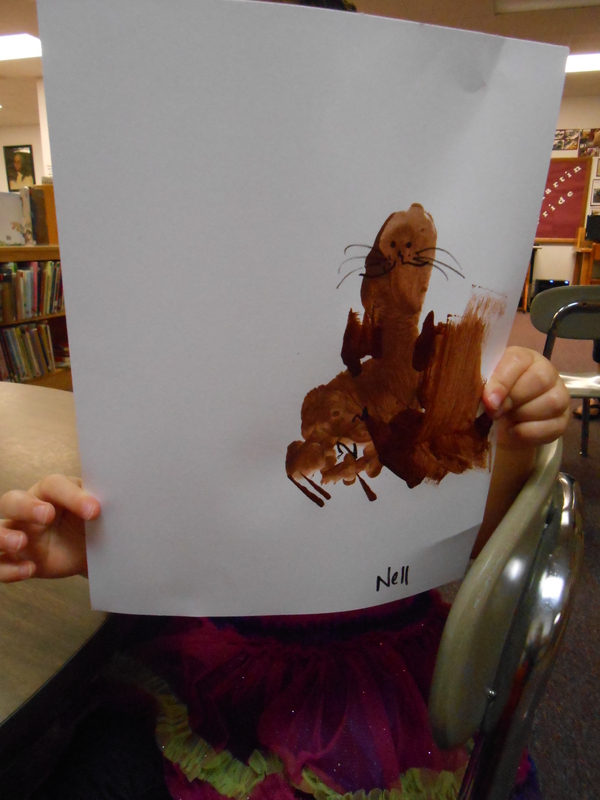 Alicia decided that the foot otter was the cutest craft and that the toddlers would have all kind so fun with an activity that involved paint and feet. To make her own to show off, she painted her foot. Brown paint does not come off very easily. You must stand up in order for your painted foot to transfer properly to paper. You will learn if you have a high arched foot. If you do (as Alicia does) you need to roll your hand under the paper to get all the paint off your foot and on the table. So, sit. Hold up foot. Press paper to to painted foot. Roll arm under paper to get the full paint off the foot. As it would happen, Alicia suddenly had an important unplanned meeting with a patron while this was happening. There is no way to present yourself professionally when painting your foot. Anyhow, the end result looked like this! We had a photo printed out of how it should turn out and then there was what ours turned out to look like. While different, I think it’s adorable! 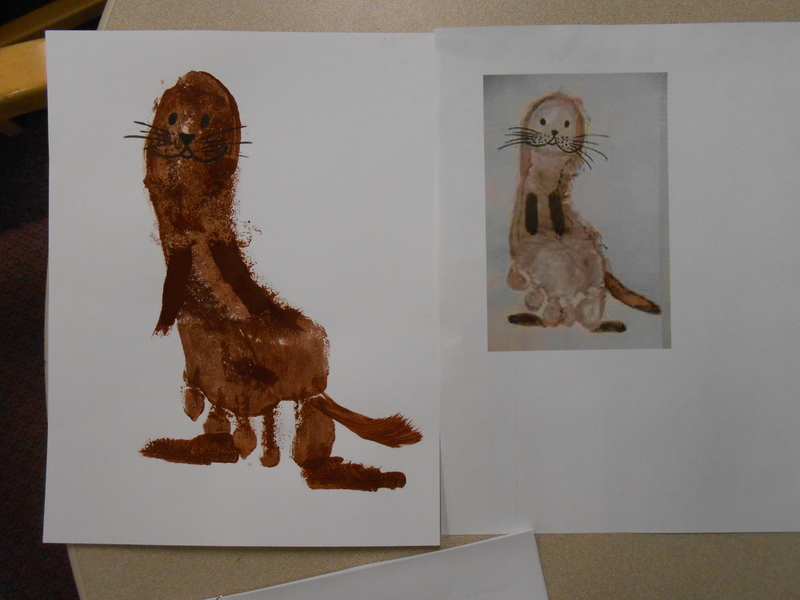 To paint the face, Alicia only had to wait for the paint to dry and then add it to the foot otter. Now to give the toddlers a go at it! We had the toddlers paint their feet as soon as they were settled into the library. After Alicia had them sit on a stool and paint their foot, their moms pushed the toddlers foot onto the paper to get the design. Then our toddler was immediately spun around on the stool to have their foot dunked in warm soapy water where Denise painted their foot. This activity had the kids laughing and when the phone rang Denise debated answering with, “Busy painting feet here, call back later!” and while that would have been funny to us it may have been confusing for anyone on the other end. While the feet papers dried, the toddlers sang songs and listened to the story on the computer. Thank goodness because the foreign words were going to be a wee bit tricky! There was a little glitch in the movie but the kiddos handled it great and soon the video finished and it was off to complete the masterpieces. It’s always fun to see how the crafts will turn out! Mason had a big grin! Nell was so proud of her photo she wants you to see her painting and only her painting. She was really good at getting ONLY her painting in the photo. Great times! So happy to have Toddler Time back!